Lust for local – check out Bunbury’s CBD for cool vintage, second-hand marketplaces, and independent boutiques. As the South West’s shopping capital, the high-street brands are here too, with major shopping centres, numerous department stores, plus home-maker precincts. The largest shopping centres include the Bunbury Forum, Bunbury Centrepoint, and Eaton Fair. The Geographe hinterland is bursting with small, boutique shops overflowing with local creations and handcrafted gifts. 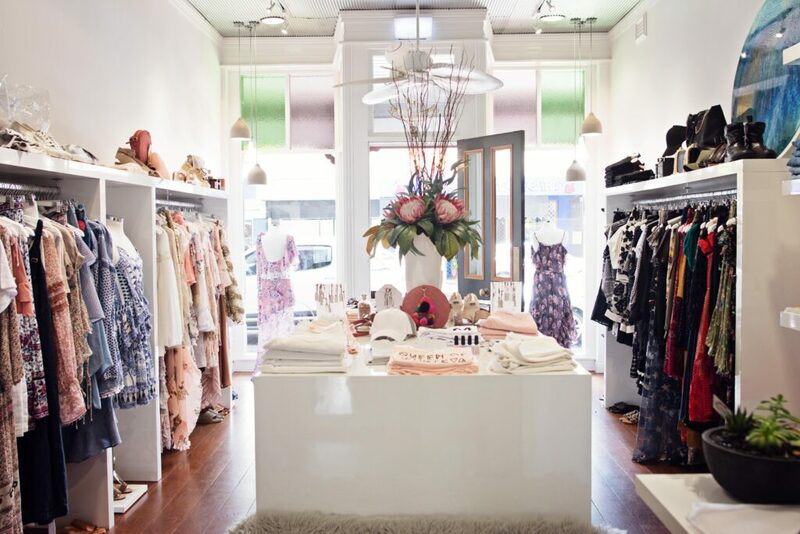 Bunbury’s Victoria Street is full of little boutique stores that are big on style. Start at Sabotage; you’re destined to do some damage here, with leading Australian labels. Nearby, Life and Soul Boutique has some of our favourite brands, as well as talented up-and-coming designers to discover. Seek out their collection of Me-I-Me (meime.com.au) jewellery – Canadian born, now Bunbury local, Heloise Fitzpatrick makes superb architecturally influenced designer pieces. Just off Victoria Street, men aren’t forgotten at Brooklyn for Men which stocks everything from a Jimmy Stuart blazer to NanaJudy streetwear. For uber cool vintage finds, 3ciana is the place to go. Unearth pre-loved designer clothing, accessories, furniture and gifts. Source beautiful shoes, bags and accessories at Shoe Be Doo. Green Depot is a green jungle in the middle of the CBD. Owner, Kim Rossiter has transformed an old workshop into an urban nursery, with a wonderland of green cascading from walls and the ceiling. Or trek to the light industrial area to unearth inspiration for inside and out at The Pottery Boutique. You’re not done yet – jump in your car and head for the hills. A little gem of a gift shop, White Stones Gifts & Homewares in Collie combines understated Scandi-style with exceptional country service. Think Aura by Tracie Ellis throw rugs, The Aromatherapy Co Candles, Indus design cushions, Nicole Fendel jewellery, Maison linen, Chimi eyewear, Hunter skin products, and Mizzle baby clothes. The nearby, Cheeky Squirrel is so worth the two-minute legwork to get there. If you are slightly on the mature side of life. WHAT ARE THE COMMON SHOPPING HOURS? Shopping hours vary across the region – google before you leave. Many shops close on Sunday, and in the more rural area’s shops may close at noon on a Saturday too. Most shops open at 9am and close at 5pm on weekdays. However, bigger supermarkets and shopping centres are open until 9pm. Hours vary on public holidays.